How to Build your Brand & take your Business to the next level. Invest 4 hours towards transforming your business into a Blockbuster. No richest Man of a City or State or Country was a salaried person if you feel that your idea is potential enough to make it to start-up, sign the program to convert your SMALL IDEA to a BIG BUSINESS. 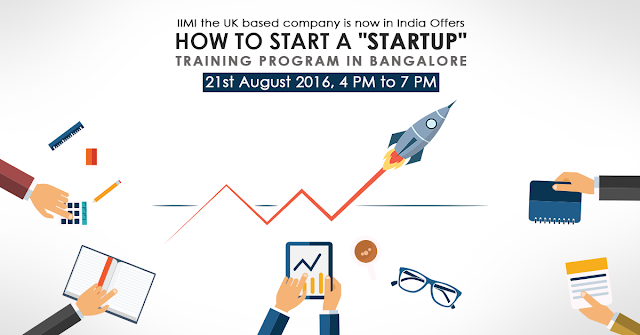 IIMI workshops in UK are priced at £225 and our Corporate clients are charged not less than £297 per candidate, however when you attend our workshop you only have to pay INR 750. We help you to launch your business, create your brand so that you will position yourself in the market and become the go to business and attract your ideal customers. Why is Guidance So Important for the success of your startup? We live in an Entrepreneurial world, every Man made thing that you see right now around you was a Start Up once upon a time, but you see those products which are successful or rather which was made successful so what about rest? Only 3 out of 5 Startups reach the second year and rest go back. Predominately it’s because of “Lack of Guidance”. Everyone gets carried away from worldly term “Start Up” and assume they can make it without appropriate guidance. Guidance is not about knowledge, experience or financial support one has, because with these support people still fail in the market. It’s the wisdom of taking right decisions with available resources and its quite essential to have right view and path to proceed with your Start Up. In this Startup Sequence Workshop, you will get the step-by-step guide to work develop and create your Start-Up, you will also get the framework to market your business in the right market to your ideal customers and you will go home with The Business Booster Map which will guide you when you to overcome hurdles . Be Warned: This is closed door workshop and hence we can accommodate only 50 Candidates for which 37 has already booked, go ahead and book your seat right now. Later we wouldn't want to be disappointed at the door. 4 Hour Workshop Reveals... The Ultimate Startup Sequence To Kickstart your Business Idea, Build a Brand and Position Yourself in the Market to Attract Your Ideal Customers. To stand against the competition wave. About International Institute of Multiple Intelligence. International Institute of Multiple Intelligence offers wide range of training's across different platforms. We at IIMI has been changing the game for over 8 years. With over 60 specialist trainers who has delivered exceptional programs in United states of America, United Kingdom, South Africa, China, Hong Kong. IIMI works with you to identify the business and organizational issues you face and what you want or need to change for your organization and your employees. We have been helping entrepreneurs like yourself to kick start and launch business ideas for a long time in UK and across the world. We compose powerful tailor made coaching platform that's currently being used by over 822 business owners and entrepreneurs. Our brand building strategies have helped businesses to get noticed in the crowded market and connect with their idea customers, our lead generation and sales conversion tactics have helped them to increase their bottom-line profits - but more importantly I have helped many entrepreneurs to fulfil their dreams.